This summer’s Maverick Concerts season has been heavy on 20th-century music, especially that of Benjamin Britten and his friends and colleagues. 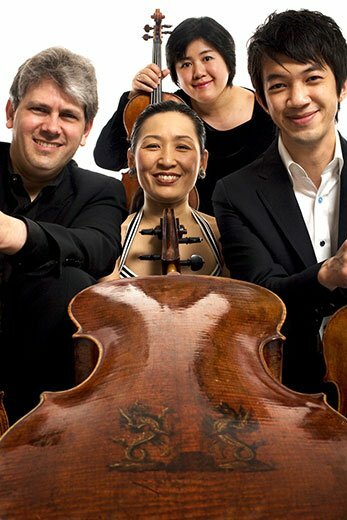 On Sunday, the Borromeo String Quartet played a totally 20th-century-free program. The Borromeos had substituted on relatively short notice for another ensemble (which did have 20th century music on its canceled program), possibly explaining the age of the music. However, nobody was complaining about this wonderful concert, including your reporter. Borromeo first violinist Nicholas Kitchen grew up with the sound of the organ in his ears—his father played it—and in recent years he has been arranging some organ works for string quartet. This concert began with an effective Bach arrangement (the “St. Anne” Fugue, BWV 552) and ended with one of Brahms’s Chorale Preludes as an encore. Both were well played, but in context they seemed almost beside the point. We’ve certainly heard Beethoven’s Quartet in E Minor, Op. 59, No. 2, often enough to know what we expect. The Borromeo performance, though, had some surprises. Violist Mai Motobuchi and cellist Yeesun Kim are powerhouse players, and their effect on the basic sound of the ensemble is to make it sound more bass-heavy than we’re used to. This is not a complaint, just an observation. Kitchen and second violinist Kristopher Tong play strongly enough to hold their places strongly. But the balance of this quartet makes its sound larger than the normal quartet sound, a very interesting experience and one which served the music on this program very well. I did find the interpretation of the Beethoven first movement a bit over the top, almost frantic at moments. The playing calmed down in the Adagio molto into a heartfelt expressiveness, and the Allegretto was almost relaxed. The finale, marked Presto by Beethoven, was actually not all that fast, but it had plenty of spirit. Dvořák’s Quartet in G, Op. 106, isn’t “better” music than the Beethoven (whatever that would mean), but it was even more welcome, being an unjustifiably rare visitor to our concert halls. I could make a good case that Dvořák is the most underrated composer in all of classical music. We know some of his pieces very well, but many of his best works hardly at all. This piece is dramatic, prophetic, and totally engrossing, and the Borromeos’ near-orchestral sonority was just perfect for it. Dvořák cultivates a very big and dramatic approach with huge crescendos, long pauses, and double stops. In the large-scale first movement (not that anything about this quartet is small), the music has complex texture, abrupt changes of mood and key that sound almost like Janácek, and places where the music seems to go off on a tangent only to reveal its very sensible purpose. The lyrical Adagio ma non troppo was just plain gorgeous in this performance, very emotional without hinting at sentimentality. The third movement was surprisingly hard-driving but not harsh, and the quartet concluded with very fancy playing of the finale. The large audience stood and cheered at the work’s ending, inspired, I suspect, not only by the great performance we had just heard but also by the great and unfamiliar music.